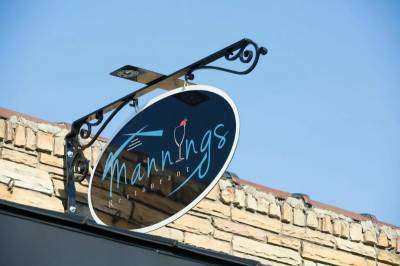 Downtown Clayton welcomes its newest restaurant, Manning&apos;s, this Friday. Joining Clayton Steakhouse (opened in 2008), Lucky Chicken&apos;s Peruvian Restaurant and Festejo&apos;s Mexican Bar & Grill, Manning&apos;s is a welcome addition in Clayton. Chef Manning, who trained at Johnson and Wales, has more than 20 years experience as a chef including McKinley&apos;s Pub here in Clayton. 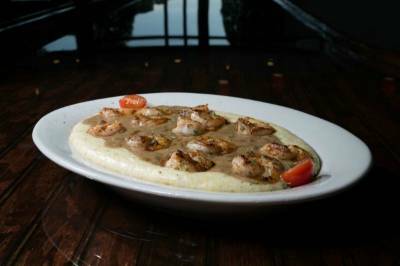 The menu pulls from Manning&apos;s extensive experience, resulting in a flavorful twist on his favorites. Diners can look forward to low country dishes like shrimp and grits, and gulf coast gumbo. The restaurant also offers two bar areas, one downstairs and one upstairs, and an open air deck for outdoor dining. Who is Chef Howard Manning? Chef Manning and his wife, Jennifer, are opening Manning&apos;s this weekend. Chef Manning was raised in Marion, South Carolina and his been cooking since age 3! To say cooking is his passion might be an understatement. His first "official" culinary position was at age 14 when he worked at Camp Carolina in Brevard, NC. While there, he met many culinary student interns from Johnson & Wales, so it is no surprise he chose to get his formal training there. He worked at a number of prestigious restaurants across the southeast from South Carolina to Florida before coming to Raleigh several years ago. When the Mannings decided to make the Raleigh area their permanent residence, they bought a home in Clayton. Chef Manning traveled to and from Raleigh for quite a while, but then had the opportunity to work with the team at McKinley&apos;s Pub on Highway 70. Passing through downtown Clayton, Jennifer saw a for sale sign in the storefront at 406 E. Main Street, and a dream took its first step toward reality. They look forward to serving great food and becoming another anchor in this growing foodie destination. What makes this restaurant unique? This address has been a pharmacy and an auction house. The transformation to restaurant required considerable enhancements, including raising the roof on the second floor to create a light, airy casual dining area and rooftop deck. 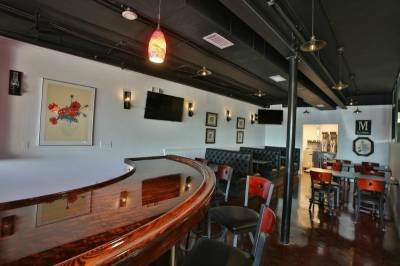 The first floor offers comfortable seating in the dining room, a bar area with large screen TVs and a private dining room that seats up to 25 comfortably. Keeping with the local, small town feel, he commissioned local artist, Kimberly Tracy to create a mural that features long-time local businesses. Take a look and see if your favorite made the wall. The rooftop deck offers a unique outdoor dining experience, and tables are available on a first come-first serve basis. 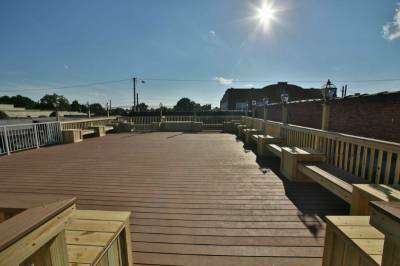 While waiting for tables, guests can enjoy a drink from the upstairs bar and relax on the benches that wrap around the deck. Live entertainment will also be featured here. Because parking is limited on Main Street, the Mannings added well-lit alley access to the rooftop deck. Park in the new lot at the corner of Main and Lombard Streets, cross Lombard and you&apos;ll see the stairs at the far end of the building on your right hand side. Details indoors tell a story that complements the food. To your right as you enter, you can&apos;t miss the long bench, called a Joggling Board, that runs in front of the window. The Joggling Board brings back fond memories from Chef Manning&apos;s childhood, and he knew that when he opened his own restaurant one day, the Joggling Board must be part of the experience. Toward the back of the main dining room, the industrial stained glass windows come from the original building, preserved and repurposed in the restaurant. If you walk up the ramp toward the kitchen and turn left, you&apos;ll discover items reminiscent of Chef Manning&apos;s childhood in South Carolina and his new home here in North Carolina. Even the Manning&apos;s logo has meaning. The cross hatch and three lines above the Manning&apos;s name are suggestive of a roof and stairs, an artistic nod to the restaurant&apos;s unique rooftop space. What makes Manning&apos;s food different? Of course, Chef Manning&apos;s training and experience are a benefit to this new restaurant. His staff, many of whom have worked with him at other restaurants, are seasoned veterans of the restaurant industry. The southern menu is different from other restaurants in town, offering diners a unique choice not previously available downtown. Most items on the menu can be adapted for gluten-free and other dietary restrictions. While the southern entrees caught my attention, the menu offers a variety of options including American dishes, burgers and sandwiches, Cajun/Creole and vegetarian items. The menu is not too large, but offers a sufficient variety to suit every taste. For directions to the restaurant at 406 E. Main Street, Clayton, click here. To learn more visit their website. You can also follow Manning&apos;s on Facebook and Twitter. **Photos provided by and used with the permission of Divine Marketing Group.